Critics are questioning why the state Department of Public Instruction’s main site shut down during Hurricane Florence and directed visitors to the personal site of Superintendent Mark Johnson, a News & Observer report said Monday. Johnson’s taxpayer-funded site — which, in many ways, resembles a campaign site — was created weeks ago, stirring up questions from members of the State Board of Education as well. Members also questioned Johnson’s June purchase of $6 million in iPads to support K-3 literacy, after a Policy Watch report in August uncovered a trip last October in which Apple officials “wined and dined” state leaders like Johnson and powerful K-12 budget writers in the N.C. General Assembly. The Republican has had a contentious relationship with the board since his 2016 election, even though the board has also been piloted by GOP leaders. As Hurricane Florence bore down on North Carolina this month, the state agency that oversees public schools shut down its website and referred people to a new website created by State Superintendent Mark Johnson. 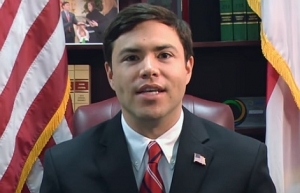 Critics of Johnson are charging that it was a politically motivated decision to shut down the state website and to direct traffic to Johnson’s website, www.ncsuperintendent.com. But state education officials say they shut the state website down as a safety precaution and referred people to Johnson’s website and to the State Board of Education’s website, stateboard.ncpublicschools.gov, to make sure people had a place to go during the storm. “We had a time-critical decision to make and I made a decision based on what my abilities were to have a page that would be up,” Drew Elliot, chief of communications for the state Department of Public Information, said in an interview. The decision has generated a buzz on social media sites for teachers in the state. Johnson’s new website went online earlier this month, with state board members questioning why it was created instead of the superintendent using the existing DPI website (www.ncpublicschools.org). “We are not where we need to be technology wise with the DPI website to be able to do some of the things that we can do if I just have one of my own staffers create a website,” Johnson said at the Sept. 6 state board meeting. Johnson said one of his staffers created it for free instead of paying $15,000 to the state Department of Information Technology to develop the site. Bill Holmes, a spokesman for DIT, said that if a state agency has a large amount of data or an expedited time line that the department might recommend hiring outside contractors to assist development of a website. Elliot said ncsuperintendent.com is a taxpayer-funded website maintained by DPI. He said it cost $174 to build the website and will cost $9.92 a year going forward to maintain it compared to $9,100 a year to maintain the state board site. In the week Florence came ashore, DIT sent a message saying state agencies with sites potentially in the path of the hurricane should shut down all IT equipment by Wednesday. Elliot said DPI technology staff made the decision to shut down the state website at 2 p.m. Sept. 13. With the site going down, Elliot said he asked whether they could redirect people to external websites. “We made a decision to link to those sites so people wouldn’t get a 404 error,” Elliot said. DPI’s website was restored Sept. 15 after it was safe for staff to return to the office in Raleigh, according to Elliott. At least one other state agency in Raleigh, the Secretary of State’s Office, shut down its website during the storm. Holmes said he wasn’t aware of any other agencies in Raleigh that shut their websites down during the storm. Egan charged in a post that Johnson was using Hurricane Florence to manipulate people to look at his new website. Elliot said the decision to link to the websites for Johnson and the state board was made by him and that the superintendent wasn’t notified until after it happened. Elliot also said the new website is owned by Johnson in his official capacity as superintendent. He compared it to how taxpayer dollars are also used for Gov. Roy Cooper’s official website, governor.nc.gov. State board members, who’ve been clashing with Johnson, will also likely be asking questions about what happened with DPI’s website. Eric Davis, the newly elected chairman of the state board, was out of the country on a church mission trip and said last week he had not heard about the DPI site being shut down and redirecting traffic to Johnson’s site. “I feel certain that the board will have further questions for the superintendent,” he said.